This face, with its straight nose, clearly carved eyes, and wavy moustache is gently oval-shaped in North West Indian style, displaying the influence of Hellenistic traditions under the great Kushan rulers. Despite the urna on the forehead, the Indian-style bejewelled ears feature a lion motif, indicating that the face is that of a secular figure. This has led researchers to suppose that such bodhisattvas and there are very many of them occasionally represented local sovereigns. This impression is reinforced by the naturally wavy hair which is gathered into a chignon on top of the head, and held in place by large jewels and a rectangular cabochon on the forehead attached by beaded cords. Although the head is considered to be in the “Greco-Buddhist” style, it nevertheless appears Indian. The Western influences with their Hellenistic realism have been integrated into a new art where the rather languid charms of an effeminate grace conjure up Northern or even Iranian origins. The head must have belonged to a statue of a standing bodisattva of the type that were found in the niches of Buddhist chapels and monasteries. 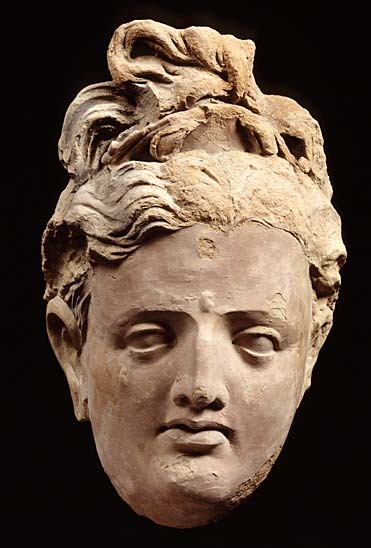 The Gandhara style, a key factor in the propagation of Buddhism in Central Asia, flourished under the Kushan dynasty, during whose reign the earliest humanized images of Buddha appeared. These attested to theological developments that revealed a new spiritual need for devotional images and led to the emergence of Mahayana Buddhism which was to spread, exporting the Gandhâra style, along the Silk Road to the Far East.